In a saute pan, over high heat, drizzle olive oil then lightly cook onions and garlic. Add tomatoes and reduce heat. Cover and simmer until tomatoes are falling apart. Add paste. Cook for another 15-20 minutes then use a hand mixer to puree the sauce. Let it continue to simmer or move on to the good stuff. Assuming that the bulgur is already cooked, drizzle a little more olive oil, this time into a skillet. Pour marinara sauce into the pan to cover the bottom. 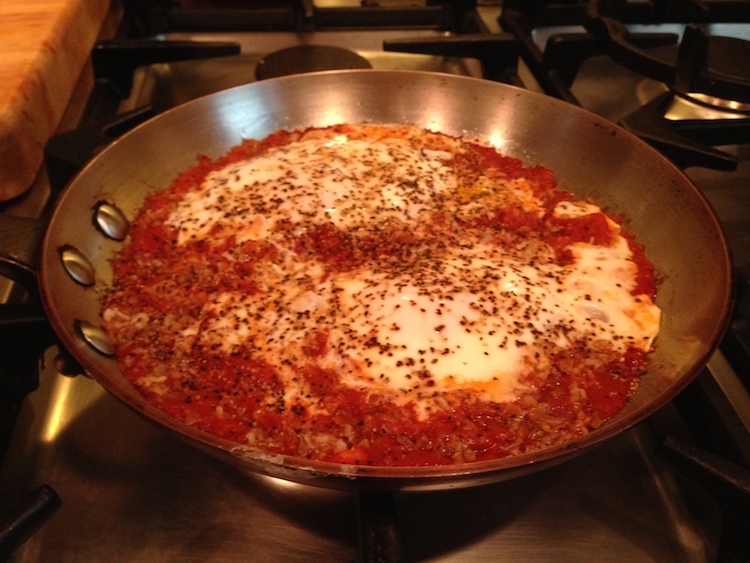 Sprinkle bulgur on top, then create divots for your eggs. Gently crack eggs and place them into the divots, cover and allow to cook on low heat until desired consistency of eggs. Serve immediately.